Treat yourself to this tea filled with the goodness of honey, lemon, ginger, and cinnamon when you’re battling a sore throat or just when you want a hot beverage that’s good for you. The lemon in this nutrient-rich beverage helps you metabolize fat, and the touch of honey helps wean you off overly sugary drinks that boost your energy momentarily only to leave you feeling in the dumps later. Enjoy this soothing drink in the morning, with ginger to help rev your mind for the day and cinnamon to boost to your heart health. Save extra in the refrigerator to have some on hand any time you want or need a little boost. Boil water in a teapot or stockpot. Cut lemons in half, and juice 3 halves. Cut remaining half into thin slices. 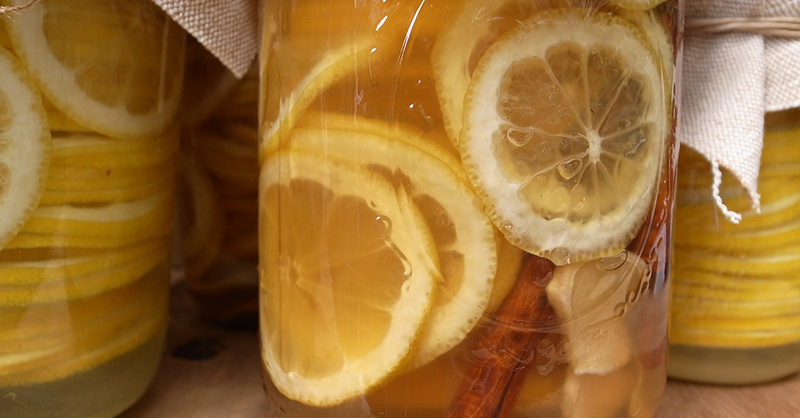 Add cinnamon sticks, lemon juice, ginger slices and lemon slices to the hot water. Cover and steep for 15 minutes or longer. Add honey to taste. Serve immediately, or store in glass jars and refrigerate for up to 4 days. Recipe adapted from Prostate Cancer Foundation.